This division is the Pittsburgh Steelers to lose. The Cincinnati Bengals are a playoff caliber team and will give them a run for their money, if they can stay healthy. Since winning the Super Bowl in 2012, the Baltimore Ravens are just 31-33 with one winning season. The Cleveland Browns won just a single game last year and are looking at starting rookie QB DeShone Kizer in week 1. The Steelers will likely sweep the division but I am giving the Bengals a win at home against them. Cincinnati should also win 5 divisional matchups. Baltimore and Cleveland's only wins in the division will come against each other. Pittsburgh is 5-1 against the Bengals over the last three seasons and won 3 straight games in Cincinnati including a playoff game. They are also 5-1 against the Browns. 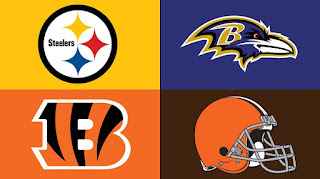 The Ravens have had the Steelers number, with four wins in their last 6 regular season contests. Baltimore also won a 2014 playoff matchup in Pittsburgh. Against the Browns, the Ravens are 5-1 with their only loss coming in OT. Cincinnati is 5-1 against Baltimore and Cleveland since 2014. The Bengals average 30 points per game against the Browns during their 5 game win streak. The Steelers do not have any easy schedule, with games at Heinz field against the Vikings, Titans, Packers and Patriots. Cincinnati lucked out, hosting Buffalo, Chicago, Indianapolis and Detroit. Their toughest matchup is against the Houston Texans. Baltimore should be able to pick up wins at home against Miami and Chicago while the Browns get to host the Jets and Jaguars. No team will travel less than Pittsburgh this season, with road games in Chicago, Detroit, Houston, Indianapolis and Kansas City. The Bengals might only win a road game outside of the division against the Jaguars with games against the Packers, Broncos, Titans and Vikings. Baltimore and Cleveland are the only teams in the division that fly to California with games against Oakland and Los Angeles(Chargers) respectively.